Even before the Japanese surrender, Communist led Vietminh forces had been taking control of the northern provinces of Vietnam. When the war finally ended after the atomic bombing of Hiroshima and Nagasaki, the Vietminh marched into Hanoi. The forces entered the city on 19 August to a tumultuous reception. 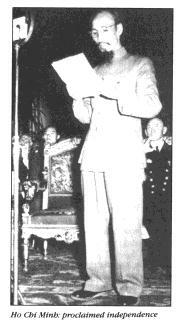 Soon afterwards, on 2 September, the Communist leader, Ho Chi Minh, proclaimed Vietnamese independence from French rule in front of a crowd of half a million people. Ho's expectation was that the victorious Allies would accept this fait accompli and that the French would have to negotiate on Vietminh terms. While the Vietminh were strong in the north, in Saigon and the south they faced a challenge from rival nationalist and socialist organisations, including a strong Trotskyist movement. They warned that independence could only be achieved through struggle and the Allies could not be trusted. The Vietminh established a provisional government in Saigon, the Committee of the South, but when the British arrived it had still not succeeded in gaining undisputed control of the city. South Vietnam had been placed under British control at the Potsdam, conference of July 1945. The British commander, Lord Mountbatten, sent over 20,000 troops of the 20th Indian division under General Douglas Gracey to occupy Saigon. The first soldiers arrived on 6 September and increased to full strength over the following weeks. The Committee of the South attempted to open negotiations, but was ignored. As Gracey later boasted, 'I was welcomed on arrival by the Vietminh. I promptly kicked them out.' Instead he set about driving the nationalists off the streets, banning meetings and demonstrations, closing down the Vietnamese press, prohibiting Vietnamese from carrying weapons and restoring Japanese curfew regulations. On 23 September, with his connivance and under his protection, French troops staged a coup. They seized public buildings, including the town hall, and made widespread arrests. This provoked fierce resistance. Saigon was paralysed by a general strike and fighting broke out in many parts of the city. Barricades were erected and poorly armed rebels attempted to fight it out with heavily armed British troops. For a while it looked as if the British were in danger of being cut off from reinforcements when Vietnamese forces nearly succeeded in overrunning Tan Son Nhut airfield. They were driven off. While this fighting continued the Vietminh took the opportunity to destroy the Vietnamese Trotskyist movement, executing its leaders. At last the British secured control of the city but only after the liberal use of artillery, the deliberate burning of areas held by the rebels and the rearming and use of surrendered Japanese troops. According to Edmund Taylor, an American officer in Saigon at the time, the city reminded him 'of a town newly occupied by Franco's forces in the Spanish Civil War'. After the city was cleared fighting continued on the outskirts and into the surrounding countryside. Here once again use was made of Japanese troops in an effort to keep down British casualties. The orders issued by Gracey instructed his troops to 'always use the maximum force available to ensure wiping out any hostiles... If one uses too much no harm is done'. By the end of December--as large numbers of French troops began arriving--British withdrawal began. Gracey himself left at the end of January but the last British soldiers were killed in Vietnam in June 1946. Altogether 40 British and Indian troops were killed and over a hundred were wounded. Vietnamese casualties were officially 600 killed but unofficially three or four times higher. Gracey had saved Vietnam for the French and thereby precipitated a war of national liberation that was to last another 30 years. Although less well known than British intervention in Vietnam, the British intervention in Indonesia was a much more serious affair, involving over 60,000 troops and considerably greater loss of life. It also provoked a remarkable display of working class solidarity. In Indonesia, the nationalists led by Sukharno proclaimed their independence from Holland on 17 August 1945, even before the Japanese surrender. They swiftly took control of Java and the other islands so that when the first British troops arrived on 29 September they were met by banners proclaiming 'Indonesia for the Indonesians'. The British, once again using mainly Indian troops, occupied a number of coastal towns (Jakarta, Demarang and Malang). Once it became clear that they were bringing the Dutch back with them, fierce fighting broke out. Once again Japanese troops were rearmed and used against the rebels. The most serious fighting took place in Surabaya. This battle is virtually unknown in Britain but in Indonesia it is celebrated as a national holiday. Some 4,000 British troops arrived on 25 October and the brigade commander, Brigadier Mallaby, demanded that the Indonesians disarm and surrender the city. Three days later they began advancing into the city and were suddenly attacked by some 20,000 rebels. The British were driven back with heavy losses: Mallaby himself was killed as were over 200 of his men. This defeat precipitated a full scale revolt against the British that spread throughout Java. The British poured reinforcements into Surabaya and on 9 November demanded the Indonesians surrender. The following day two cruisers and three destroyers together with tanks and artillery began shelling the city while RAF fighter bombers dropped 1500lb bombs on rebel strong points. Only after three days of street fighting was the city taken. Altogether British and Indian casualties were over 900 killed and wounded, while Indonesian casualties were estimated at over 10,000. Elsewhere the British were driven out of Magelang and Ambarawa. In Bandung they gave the nationalists an ultimatum to evacuate the city by midnight of 24 March. The rebels fired the city as they left, leaving the British to occupy a ruined ghost town. After the occupation of Bandung an uneasy stalemate operated while Dutch troops were poured in. These were armed and equipped by the Labour government. As their strength built up, British troops were withdrawn. The last were not evacuated until November 1946. Total British and Indian casualties were an incredible 620 killed and 1447 wounded with another 327 missing. Over 1,000 Japanese troops were killed fighting alongside the British. Indonesian casualties are estimated at 20,000 dead. The scale of the fighting was a complete shock to the British and played a significant part in convincing the generals that it would not be possible to hold Burma or India against a population in revolt. 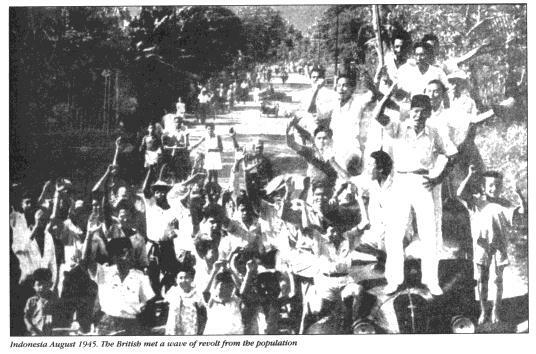 While the fighting continued merchant seamen--mainly Indians and Indonesians but including some British--went on strike, refusing to carry troops and munitions to Indonesia. Their action was supported by the Australian trade union movement and Australian dockers blacked any ships sailing for Indonesia, eventually tying up over 500 vessels. In one remarkable episode Indian seamen flown in to break the strike were addressed by the Duke of Gloucester, the King's brother, who commended their loyalty. The interpreter translated this as a ringing call to defy the imperialists and join the strike... which they promptly did! Collections for the strike were even held on British warships in Australian ports. So damaging was this display of solidarity that Mountbatten himself travelled to Sydney to unsuccessfully plead with the trade unions to call the blacking off. While both the French and the Dutch were eventually driven out of their colonies, it was British troops who had enabled them to return in the first place. These two episodes are usually removed from the Labour government's record, but they deserve to be remembered as a time when British and Indian soldiers were sent in to kill in order to restore European imperialism in the face of popular revolution.